After my visit to Yellowstone, I was looking forward to the solitude and unimproved wilderness of nearby Grand Teton National Park. Nearby is almost too generous as the parks are practically adjacent. In fact, paying your entrance fee into one grants access to the other. For most people, Grand Teton is that "other park" people see on their way from Jackson to Yellowstone, or those peaks they see from the right side of their plane as they land at Jackson Airport. 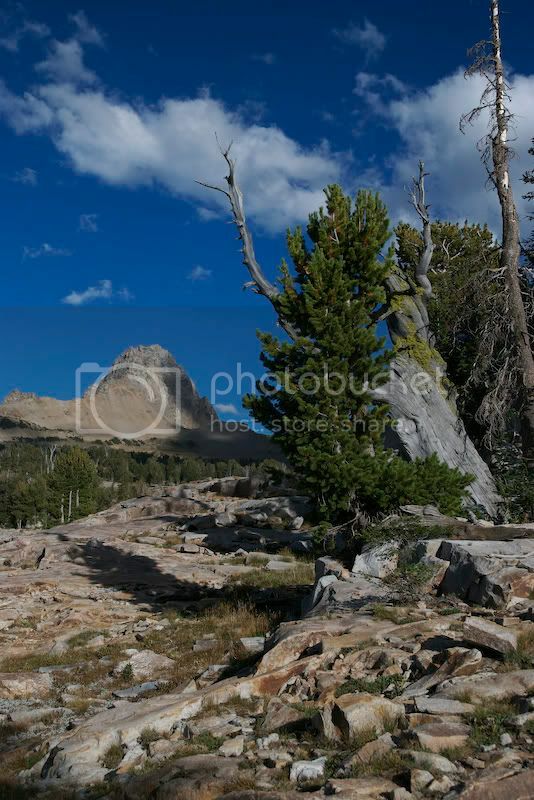 The park's main features are a string of implausibly high peaks, the highest being Grand Teton at 13,770 feet with Jackson Lake at their feet. Wyoming's highest peak is Gannett Peak at 13,804 feet, but the Grand Tetons are so grand as they rise straight out of Jackson Lake, at around 6,000, feet to their impressive summits. The name Grand Teton was given by 17th century French trappers who impassioned that the peaks resembled (Kellan, cover your eyes) "giant breasts". For my part, I get the "grand" part, but I suspect the breasts part can largely be attributed to the deteriorated mental state of a lonely French woodsman in dire need of human contact (ah, the French). Nonetheless, the name stuck and today to the range's highest peaks, eight of which are over 12,000 feet, are the most visible members of the Cathedral Group, visible from Jackson Hole and Jenny Lake below. 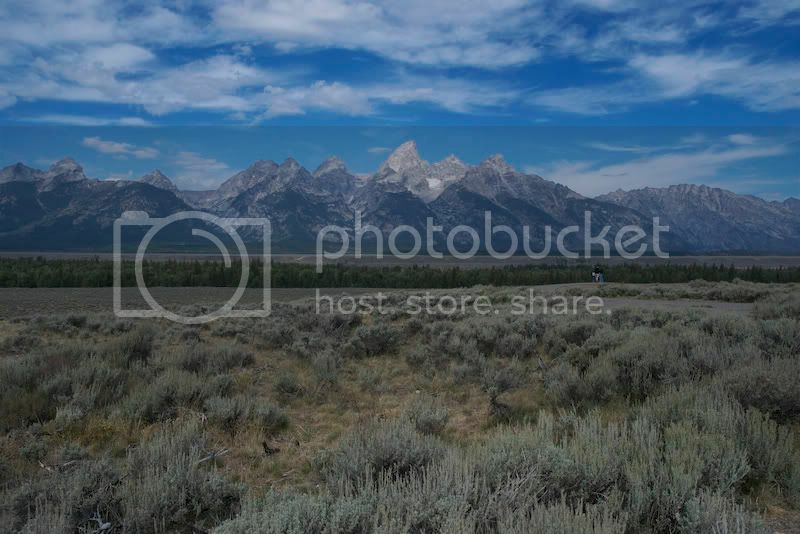 It should be noted that the Jackson Hole ski area is not within the boundaries of Grand Teton National Park, but is primarily centered around Teton Village on the outskirts of Jackson, Wyoming. Perhaps even less admired than the Teton Range is the Grand Teton backcountry wilderness, which became the focus of my visit here. 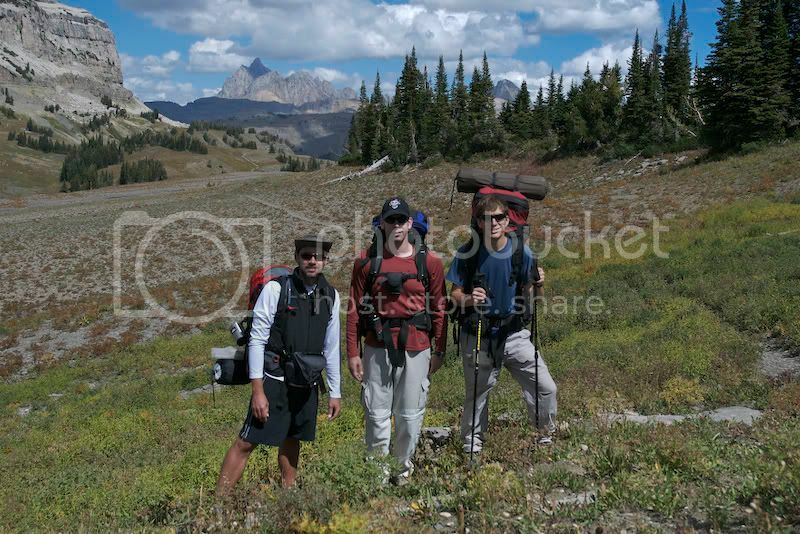 On this portion of my travels I was pleased to be joined by two friends to venture out into the Wyoming wilderness for an extensive backcountry trek across the rugged yet awe-inspiring terrain. Joining me was Tom Cronin, hailing from Ogden, UT. Tom was my college roommate and intellectual peer at KU. If you click on his profile, you'll see that Tom used to have an affinity for both long hair and excessive amounts of tuna. Today Tom makes airbags, and would appreciate it if you either bought a new car, or crashed the one you own sufficient that its airbag would need replacing. Also joining me from San Francisco was John McDermott. Most of you know John or at least recognize him from the many photos on kriskoeller.com. John and his wife Carey would often travel without a camera relying on me to photograph the events sufficiently that they could subsequently share with friends and family. Now that I am also providing written accounts of these ventures, I fear this may become a troublesome precedent. At any rate, John cashed in his Delta miles to fly to Jackson over Labor Day weekend, using a borrowed pack for only his second backpacking trip ever. For this I admire his courage. 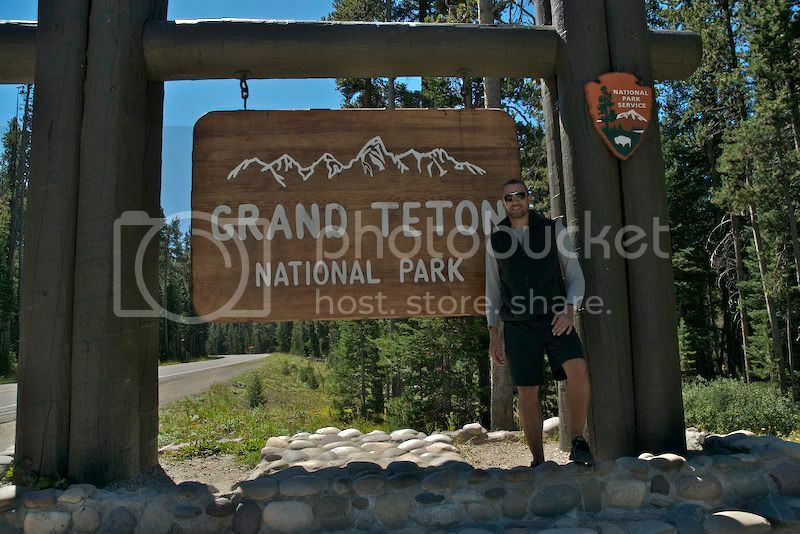 I met up with Tom in Jackson and we traveled to the nearby Grand Teton Visitor Center to secure the necessary permits and determine our route for the weekend. 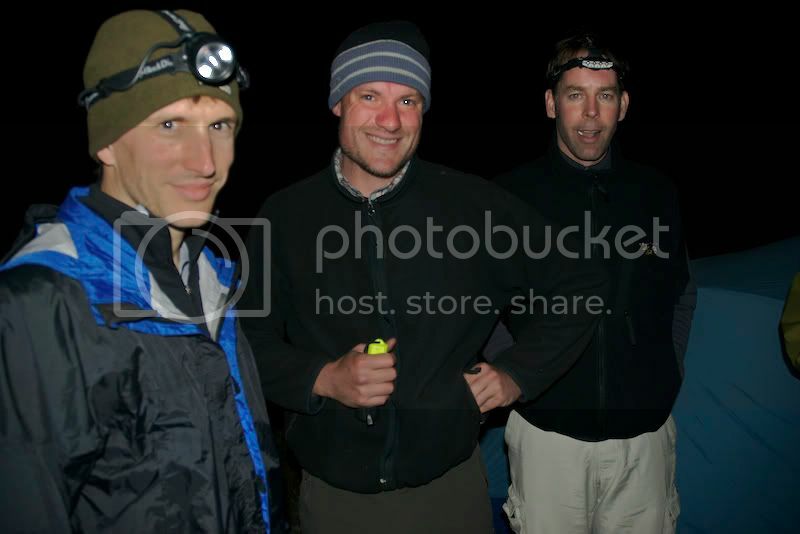 The trek we selected consisted of approximately 40 miles, and had a cumulative climb of over 7,500 feet over 4 days. As this was bear country, we also picked up a bear canister, which I'll explain in more detail later. Backcountry permits are required at all national parks, and usually are free of charge. They are necessary to regulate the numbers of hikers in the area so as not to overwhelm the sites as well as to establish a record of your route and expected date of return. Should an emergency arise, such as an earthquake, forest fire, severe storm, etc., the Park Service would be able to easily account for those in danger and act accordingly. Further, permit holders are required to read, understand and sign park regulations over conduct and restrictions for the intended area. For example, hikers are required to report all bear activity they encounter, they are required to bury solid human waste six inches below soil and 100 feet from streams, 200 feet from lakes, they may not start campfires and are advised to either boil for 5 minutes or filter water for drinking (the alternative is to carry one gallon per person per day, and at 8 pounds a gallon that's not really an option). #1: Everything tastes better when camping. In fresh air, at high altitudes and after much exertion, even the most unappealing items can be very rewarding and enjoyable. #2: Most things taste pretty good even when improperly prepared. Burned, undercooked or even raw food is satisfactory in the conditions described. #3: Convenience is king. Snack bars, dried food, fruit and anything easily reanimated by boiled water is preferred. In addition, your food should result in minimal clean up and waste, all of which must be packed for the remainder of the journey. #4: Liquor has a much higher result/weight ratio than beer, although beer may be preferred. With these rules in mind, our meals consisted of vegetarian chili with tomatoes and tortillas, spanish rice and ready-to-eat chicken in an envelope, lots of dried fruit, instant oatmeal, granola bars, trail mix, nuts, a few Snickers bars and Twizzlers. We stopped by the liquor store and got two, 750ml bottles of really bad Old Crow Whiskey, only because it was packaged in lightweight, plastic bottles. Tom opted for the lower-weight Canadian Mist, which was both lower in quantity and appeal. At high altitudes, after much exertion and dehydration, liquor can have a stunning effect. I'll let John tell his version of that story. The first day we dropped one car at Death Canyon Trailhead (such colorful names), and then commuted to Granite Canyon. Day one consisted of a 10 mile hike to Marion Lake, a high altitude Alpine lake high in the Teton Wilderness. We set out about 1:00 PM with packs weighing about 30-40 pounds apiece. Over this mileage we would climb about 3,000 feet, most of the ascent in the last 2 miles. By the end of the day, after being up until 2:00 the previous morning, we were sufficiently spent. At Marion lakes, we joined 4 other hikers with whom we would spend the next two days. Adam and Dayton were up from Portland, OR, and Sissy and Dee were natives of Jackson, WY thought Sissy now resides in Salt Lake and studies Opera. The first night we dined on vegetarian chili, and spent the better part of 2-3 hours playing a modified version of Spades while Tom kept careful score and John consumed most of our three-day supply of whiskey. That night we spotted several mule deer in our campground, which we welcomed as a sign that no bears were in the area. We finally retired about eleven, while John got up numerous times to attend to his consumption of Old Crow. The next day was an easier day. 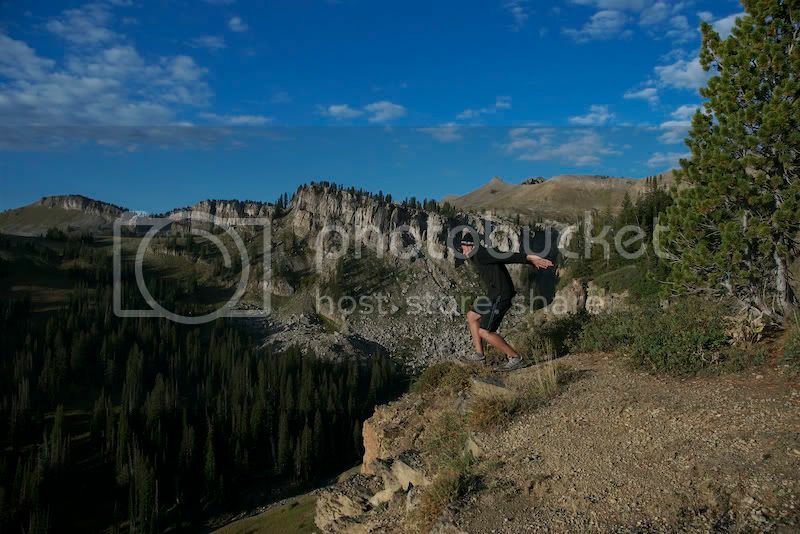 We traveled about 8 miles along the Death Canyon Shelf, a ridge high above Death Canyon and a relatively flat and enjoyable hike to Alaska Basin. Departing our camp we had our first bear encounter. He was entering the area as we were leaving. We pursued him for some distance in hopes of a closer look, but he eluded us. Hiking in bear country presents some challenges. First of all, you have to be careful about your food as the scent can easily attract curious bears. It has been reported that a bear can smell cooking bacon from a hundred miles away. At night, food must be secured in a bear canister, a specially designed vessel that a bear can neither handle nor open. Or, you must hoist your food in a bear bag at least 10 feet high and 4 feet out from the trunk of a tree. Finding a suitable tree can be a challenge, but we were aided by the presence of a bear locker our first night. In addition to food, anything producing a scent must also be secured. Toiletries, garbage, sunscreen, toothpaste, etc., must also be secured. Some also recommend that the clothes you wear while cooking must also be secured, but unless you're cooking something especially smelly, this isn't usually necessary. Having been in numerous bear situations myself, in Denali, Lassen, Yosemite, etc., I've also had quite a bit of training in how to manage a bear interaction. Bears aren't typically aggressive toward humans. You never want to surprise a bear, so its a good idea to make noise when hiking. A bear with a cub or a bear near a fresh kill can be very dangerous. If you do encounter a bear, you should never run. A bear will often chase you simply because you are running. Rather, you should speak calmly and raise your arms to appear larger, avoiding eye contact. If a bear turns sideways and looks at you, he is expressing to you his size and this is an invitation to leave, at which time you should slowly back away. If a bear rears on his hind legs, he's simply trying to get a better look and trying to better understand what you are and if you represent a threat. If a bear charges you, stand your ground. This is often a bluff and he'll turn and or stop before he reaches you. Again, slowly back away and don't do anything sudden. Its appropriate to throw stones near the bear to ward him off, and rangers often advise this to establish in bears a productive fear of humans. Many hikers carry bear spray, a derivative of pepper spray that is greatly offensive to bears. Its more useful on grizzlies as they have greater sense of smell and are more acutely affected. If you are attacked, you should drop to the ground in a fetal position, covering your neck with your hands, and lie motionless. Do not drop your pack as it may protect you. Bears will quickly lose interest and abandon you as humans are not prey to bears (they typically eat berries, grasses and carrion). Climbing a tree may be a good defense, but black bears are quite capable climbers and this doesn't always work. Grizzlies will not climb a tree, however, and will lose interest and move on. Bears do not eat people, but they may injure people to protect their young or their territory. Using common sense, you can easily avoid these encounters. Luckily, we didn't need to employ any of these measures. Grounded on bears, we did encounter one other large bear on our travels to Alaska Basin, our stop for the next few nights. I saw him coming down and across our path and moved down to get a closer look. What I didn't know was that he was very interested in some hikers whom we couldn't see down the ridge, preparing their lunch. As I approached, they reacted in any number of unknown ways sufficient to flush him out toward me. 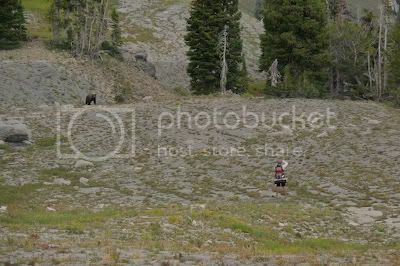 As I stopped to take pictures of him coming toward me, he began to gallop in my direction which was disconcerting as this didn't match any of the known bear behaviors I had learned. I moved back to a safe distance as he traveled by, yet I was able to get some good pictures. 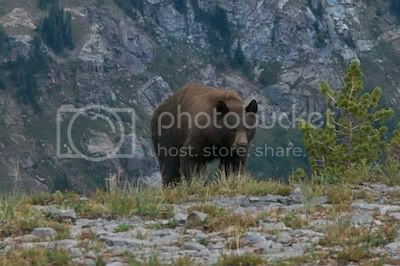 We later caught up with the unknown hikers who were pretty unsettled by the bear's intense investigation of their lunch. Finally, as we approached Alaska Basin, a collection of rocky alpine lakes below the summit of Grand Teton, I stopped to photograph the peak and noticed something moving in my camera's viewfinder. 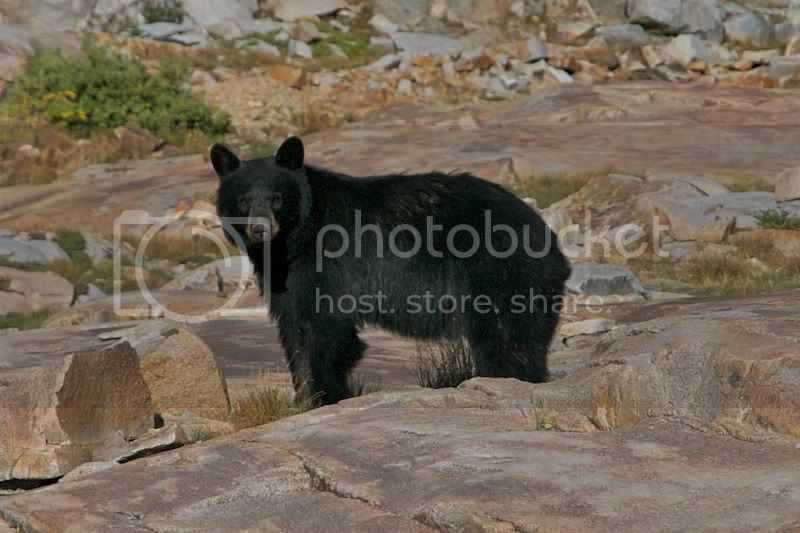 As I lowered the camera, I saw a large black bear who had been harassing Alaska Basin campers for some time. He was about 30 yards in front of me and gave me a look of, "Screw You" and sauntered off down the hill. That was our third bear encounter of the day, and our last of the trip. That night we set up camp at Alaska Basin where we would remain the next two nights. John and I swam in the lake near our camp, which was cold but not overly so as the shallow waters were easily warmed by the sun. We dined on Spanish rice and envelopes of chicken, and met up with the others to play cards. John passed on the whiskey. 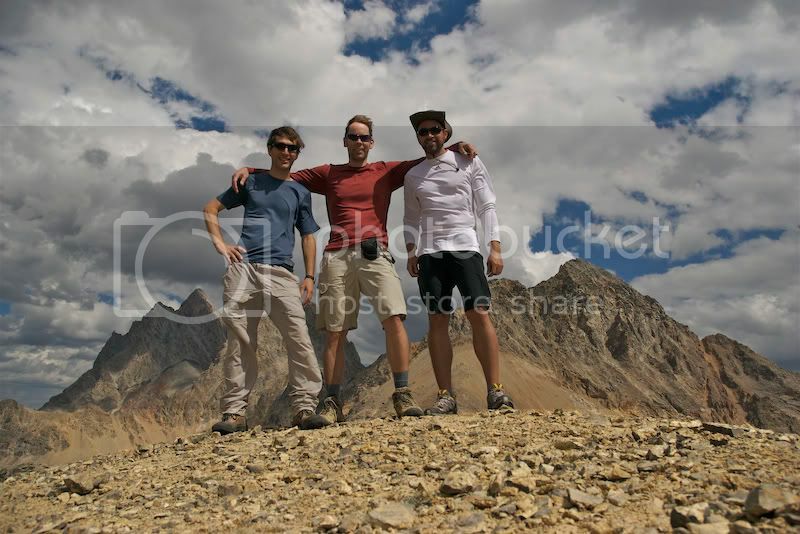 The third day was our "day off" as we established a base camp suitable for exploring the area. We hiked off trail up to the base of Grand Teton, above an improbably colored turquoise blue lake below lower Teton. This was the high point of the trip-literally. We hiked to a height of 11,108 feet and stopped for lunch. 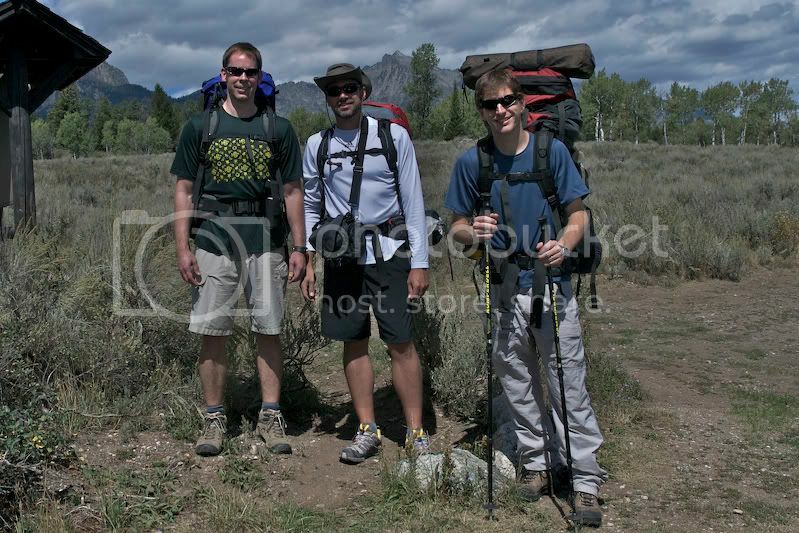 The summit of Grand Teton was readily visible, but the climb is very technical requiring both skills and equipment that none of us possessed. Instead, we rounded the bluff and descended on a treacherous, rocky ledge that required us to mostly "ski" down the piles of loose gravel and stone. By this method we descended about 1,800 feet in about an hour, looking back to marvel at both the height and ridiculousness of the descent. In total, we covered about 7 miles of the high country that day. That evening we dined on broccoli rice and more packaged chicken. That night we played Gin Rummy, and were in bed early as the next day was going to be a long one. Our last day we were up and about before 7:00 AM. John had a 5:00 flight, and we had to cover 11 miles and 4,000 vertical feet to get back to the car. This was the most challenging day of the trip. We broke camp and were on the trail by 8:00. We had to first ascend over Buck Mountain Pass, and then over Static Peak Divide, a climb of about 2,000 feet. 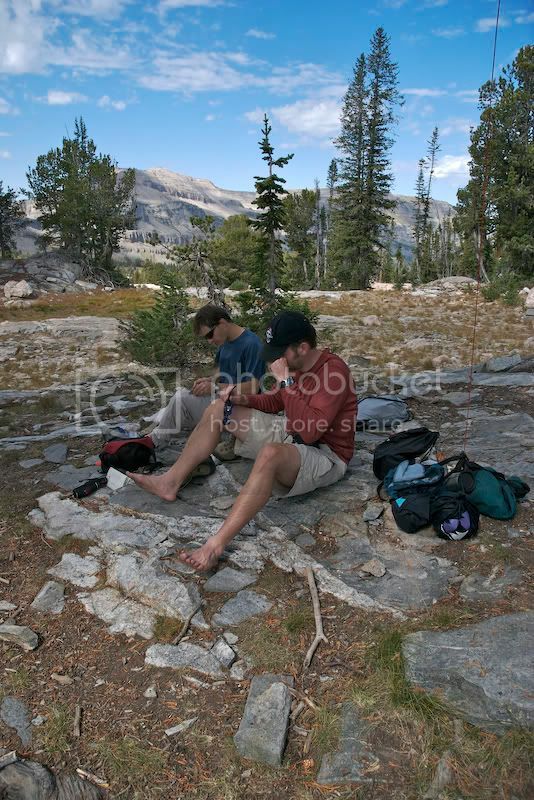 By now our packs were lighter with less food, but the fatigue of the last few days was still lingering. We celebrated our summit of Buck Mountain Pass and Static Peak Divide, but the long 7-mile descent over 4,000 feet was hell on knees, ankles and spirits. I adopted a half-jog pace and broke out in front of Tom and John, determined not to break stride until the bottom. Although I left with over 100 ounces of water, I had to stop and filter-refill twice. As we descended into the valley, the heat began to rise and by now we were hiking in direct sunlight. 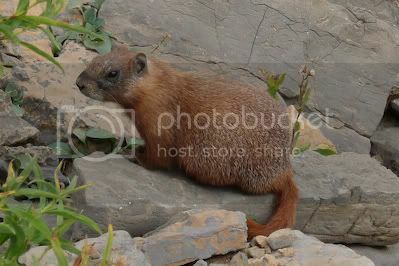 The descent was interesting to a point, but we also began to encounter numerous day-hikers which made seeing wildlife unlikely. 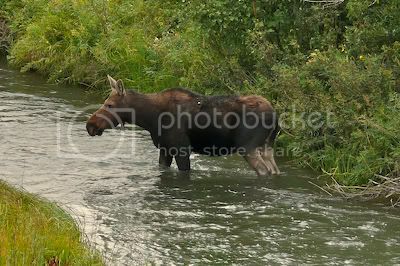 I had an alarming, chance encounter with a giant bull-moose which is probably the largest mammal I've ever seen in person. He quickly passed me, his rack nearly grazing my head as he sprinted up the hill. By the time I got out my camera, however, all I got was a picture of trees. We made it back to the car around 1:00 PM, astonished that we had covered over 11 miles and such a dramatic change in altitude. We resolved to go straight to the brewery and celebrate over some really good beer, and some so-so food. John had to be on a plane shortly so as a courtesy to his fellow passengers, Tom and I quickly rented a cheap hotel room so he could shower and then had him off to the airport, not before stopping at Dairy Queen along the way. The trip was terrific. As I mentioned, we covered over 40 miles and 7,500 feet of elevation in those four days, and saw numerous wildlife and unbelievable scenery along the way. As you descend, you can see the highway to Yellowstone and the Jackson Airport below. 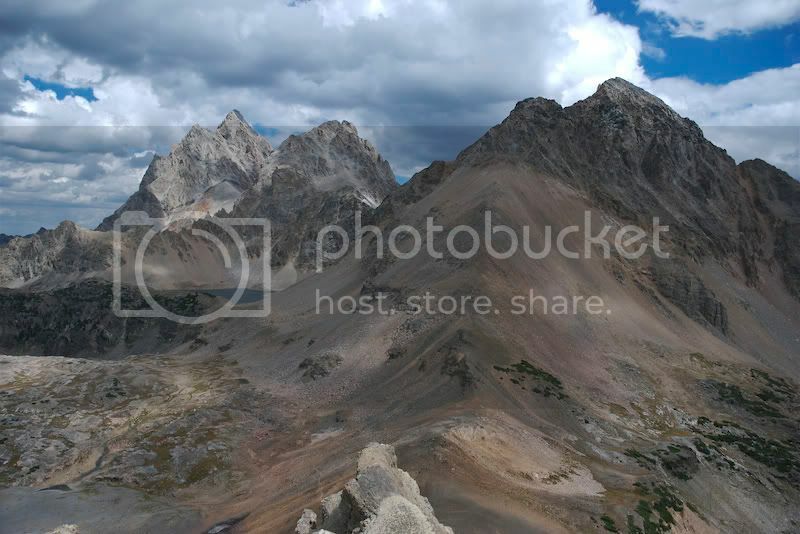 Its unfortunate that most of those travelers will never see the backcountry of Teton, as its truly an amazing landscape. As I mentioned in my post on Yellowstone, most visitors to National Parks know only of the park what they can see from their car. Getting out to the backcountry, even on a day-hike, can be a rewarding experience. Its probable that one could count on less than two hands the number of people who have stood on some of the points we did, and that is a satisfactory experience in and of itself. Pushing your personal limits against nature, in a sound and responsible way, is a truly enjoyable sense of accomplishment. I didn't take many pictures of the landscape as they probably would appear boring and not do it justice. 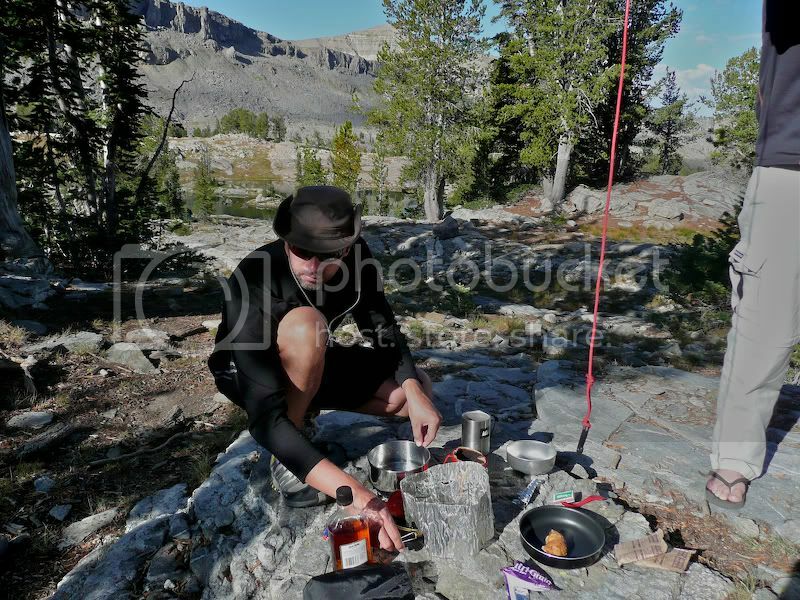 If you've never tried backcountry backpacking, do it at least once. If the appeal has to be explained to you, its probably not for you, but I think most would find it to be an amazing and memorable experience. PS: Yes, this was the Wyoming wilderness, so any Brokeback Mountain jokes will be considered lame and originated by those of low intellect.